Why Were Mexicans Illegally Training to be Pilots in South Texas? While the Hill focused last week on a Government Accountability Office report, "General Aviation Security: TSA's Process for Ensuring Foreign Flight Students Do Not Pose a Security Risk Has Weaknesses", no one seems to remember that this same issue arose last year only to fall on deaf ears. 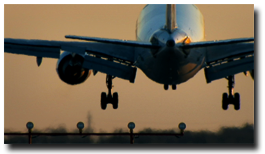 The GAO report noted serious shortcomings in the Transportation Security Administration (TSA) flight training approval and accreditation process, including not checking the immigration status of applicants and flight school owners and operators. An equally disturbing story pertaining to Mexican nationals illegally attending flight school in south Texas, however, received no media or congressional interest last fall. The source of the story was pretty credible: Rep. Henry Cuellar (D-Texas), who chaired the House Homeland Security Subcommittee on Border and Maritime Security in a prior Congress, and today is that subcommittee's ranking member. Rep. CUELLAR: As recently as two weeks ago we had a situation down close to my district in south Texas. Several Mexican nationals were discovered receiving flight training in south Texas without the proper visas. As you recall, the 9/11 involved aviation flight schools and visas also. Those are the three major — well, three major factors that were involved. In this case, while there is no indication of terrorist intent on this particular case, we know that the aircraft remain a highly attractive target for terrorists. It is troubling that even 10 years after the 9/11 we still have foreign nationals taking flight training in the United States without the requisite vetting or oversight. In fact just a few days ago the FBI and the Homeland Security issued a Nation-wide warning about al-Qaeda threats to small training — I mean, to small aircraft just a few days ago. Let me just give you briefly the facts the way I understand them. You had a pilot from Mexico that was accused of bussing a trio of boats in Fort Mansfield. That is how this got started. He was bussing some of the boaters out there. This person was taking flight lessons. He was one of several Mexican foreign nationals who traveled to the valley to get the pilot's license. Homeland Security went up there after the fact and deported three of them. Because I think the problem was that instead of using a proper M–1 student visa, because they were getting training, they were actually operating under a [nonimmigrant visitor visa]. So instead of using a student visa they were using tourist visas to get that training. Eventually FAA was asked and they said, look, Praat, which is a Mexican-based company that comes over to the United States to do the training, was leasing the aircraft to the pilots to train. Again, FAA's rule is basically the pilot is ultimately responsible for the use of the aircraft itself. So the issue that I have is after 9/11 when you had aircrafts, you had flight school training, you had visa issues, here we are 10 years later, what does this incident suggest about our progress on the broader issues of aviation security, visa security, 10 years after 9/11? Secretary, since you were there with my friend President Bush, Governor Bush, do you want to go ahead and get started on that? Then the other gentlemen, if you can answer that. Rep. Cuellar's response to former Department of Homeland Security Secretary Tom Ridge's statement was the most telling; a year later, Rep. Cuellar would be proven right. But not so fast. Cuellar's story remains important. My concern about Cuellar's information is not only that homeland security personnel should be doing more to prevent a repeat of 9/11, where the hijackers received flight training in the United States, as described in detail in the 9/11 Commission Report and the commission's monograph, 9/11 and Terrorist Travel. Beyond the 9/11 story there is the simple question: "What are Mexicans doing illegally training for flight school off the radar of the U.S. government?" I am well aware that training Mexicans illegally in the United States at U.S. flight schools on the southern border is not necessarily drug-cartel related. But I wonder if any intelligence analyst at a southwest law enforcement intelligence "fusion" center has sought to determine if there are any dots to connect between the flight school attendance described above and an ultralight plane dropping drug loads over 100 miles north of the U.S. border a year later near the now-infamous I-8 highway in Arizona. Ultralight planes are known to foray maybe 10 or 20 miles over the border, but 100? Strangely, this occurred on the same night over 330 illegal aliens crossed over a 12-mile stretch of central Arizona border and the area north of the border leading up to the ultralight drop was pock-marked with drug activity, as described in my May 2012 blog (maps included). That is a new development that I hope is causing law enforcement to seek some answers. Answers Mr. Cuellar never received. A recent story that the GAO reported on, and that Congress and the media publicized, was equally bad: TSA approved flight training for 25 illegal aliens at a Boston-area flight school that was owned by another illegal alien. Eight had entered the United States illegally, and 17 had overstayed the terms of their permitted length of stay. The only reason anyone found out was because a Massachusetts police officer pulled over the illegal flight school owner for a traffic violation in 2010 and reported him to ICE. ICE then launched a comprehensive investigation of the school, including both the owner and students. The FAA had given the owner two certifications because the FAA does not check immigration status. Neither, ironically, does the TSA, despite flight safety being the reason for TSA's existence and the fact that three of the 9/11 hijackers attended flight school in the United States without the proper student visas. The Alien Flight Student Program (AFSP) is a TSA program developed to help determine whether foreign students enrolling at flight schools pose a security threat. However, the AFSP never takes into consideration immigration status. Or at least they didn't until GAO embarrassed them with the obvious flaw. Only now, because of the GAO report, will TSA share AFSP data with ICE and ICE share immigration status with TSA. ICE provided a few more details in its July 18, 2012, testimony before the House Homeland Security Subcommittee on Transportation Security. Ironically, traffic violation checks of this sort, where police officers check legal status; and immigration enforcement audits that include both owners and workers or students, are exactly the type of enforcement the Obama administration is trying to stop across America. In other words, the 2010 investigation may well not have happened in 2012. And we certainly know that Cuellar's request for more information on the illegal Mexicans fell, and will continue to fall, on deaf ears.